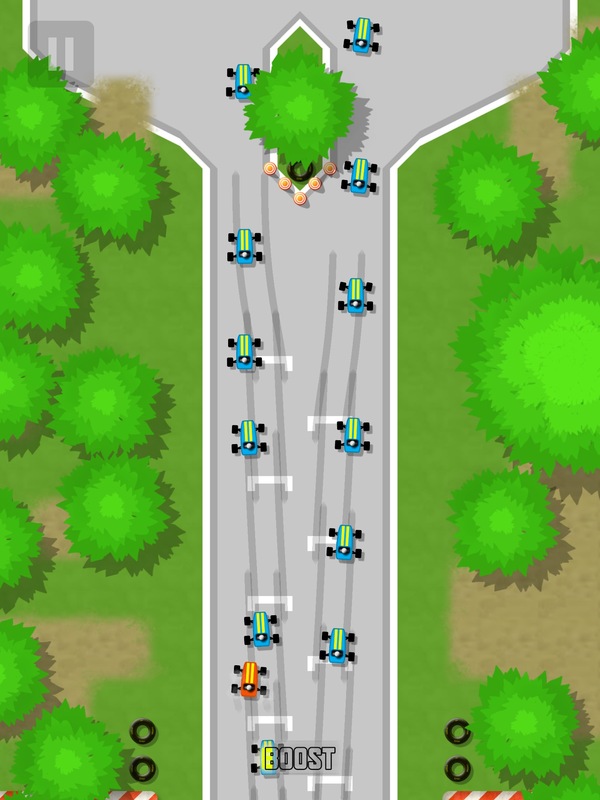 Drift’n’Drive ($3.99) is quite the fun chaotic top-down racing game. I was intrigued by the game when I saw a GIF of it in action with a whopping 32-car field, and it looked like something I had to play. And it lived up to my expectations. It’s very much an arcade-like experience. 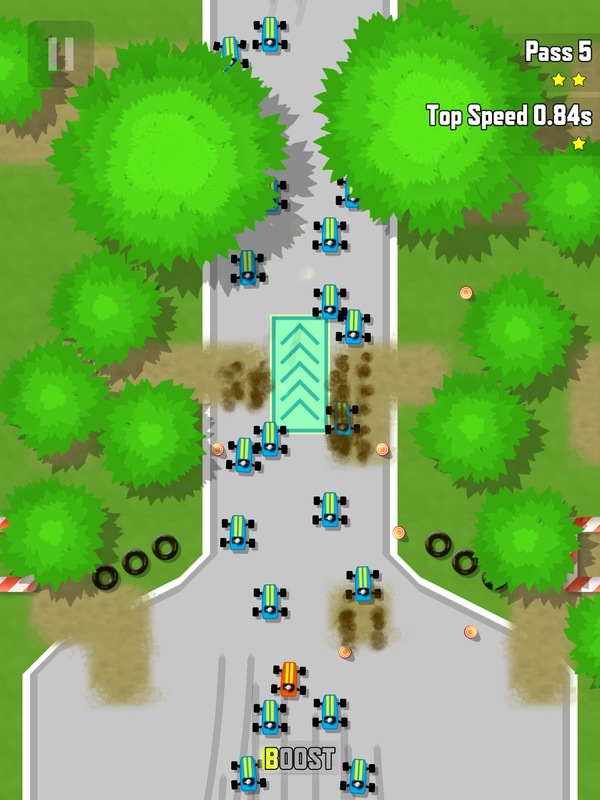 The cars auto-accelerate, and have tires with low grip, making them drift-happy, and providing for a very chaotic game. And the only controls are left and right to steer, with a turbo boost that charges up over time. Helping with the chaos is the fact that the courses are generated randomly in the career mode, so it’s about reacting to what might be coming up next and trying to stay on the road. Grass and dirt slow the car down, hitting trees and walls causes damage to the car, and it’s possible to lose a wheel, which makes steering more difficult, until both front wheels are gone, and the vehicle is just straight-up wrecked. Career mode is the star of the game, with five different circuits to play in, going from fields of 8 to 32. There’s an upgrade system to make the car’s basic stats improve, along with the helpful turbo boost, and of course the change the paint job. Time Trial and Multiplayer modes are also available, but Career mode is the most interesting because of the large fields to race against, the upgrade system, and the nuttiness that comes from trying to out-race dozens of cars at once. This is not a racing game for people who want precision driving, no, this is for the person who thinks racing is a full-contact sport. I’m always annoyed when racing games make the player car start in last no matter what. Drift’n’Drive eschews this by making the starting position of the player car be whatever position they finished at in the last race. This means that some races are effectively impossible to win without advancing in them to start at a higher up position, but it’s not necessarily the worst fate in the world, either. Because tracks are randomized each time, and there’s always monetary rewards for the stunts performed, there’s plenty of reasons to keep coming back. Repetition is not always a bad word – in this game, it’s cleverly integrated. It also means that failure is appropriately punished, though crashes are especially punishing if starting near the front of the pack. At least there’s money to be earned no matter what, and it doesn’t take long to go from one race to another. The game really picks up in its later portions, when there’s 16 and then 32 cars to race against. It’s gloriously chaotic as there’s a massive horde of vehicles drifting, boosting, and crashing into one another. The game’s drifty nature means that control is more of a polite suggestion than a universal rule. Turn softly, and don’t spin too much out of control, lest the pack catch back up. The game never slows down at all on the iPad Mini Retina that I played the game on, even with video recording enabled and a whole horde of cars on screen, which is a solid achievement even if the game is 2D and the cars are all the same color. There’s no in-app purchases for getting ahead in terms of upgrades, and there’s no need as everything is perfectly earnable through just playing. Just keep at it, get better start positions, buy upgrades smartly (try to avoid anything that downgrades other stats, as eventually it becomes possible to max out everything), and just keep at it, and glory is possible. That $5,000,000 bonsai tree ‘upgrade’ might take a while, though. There’s also the medals for each circuit, with the raritanium one being difficult to get even if with a maxed out car on the easiest circuit, as winning ten times in a row is not easy, because one big mistake could mean the end of the streak! Really, this game is all about skill, or at least mitigating the chaos inherent to the game. While the experience is relatively brief – I was able to get a gold medal on each circuit in about an hour and a half of play – it’s quite the enjoyable one. Plus, there’s the time trials, and the local multiplayer for up to four people at once. I loved my time with Drift’n’Drive, and while it especially stands out in this week’s batch of releases, it holds up pretty well overall. I highly recommend it, though I hope more circuits are in tow.